To block my Oxblood Mommes Lysedug Shawl, I soaked it in cold water and hair conditioner (yes you read that correctly!) for at least a half hour. Based on the comments on Ravelry about the Madeline Tosh superwash merino laceweight, I was concerned that the finished piece wouldn’t grow the way most lace does. In a way, this was funny since I often knit shawls using sock yarn which is superwash or at least has some acryllic in it to prevent shrinkage. 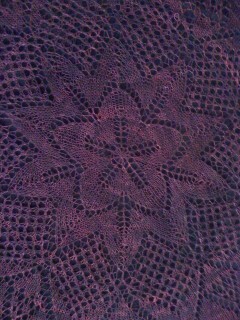 I pinned the circular Mommes Lysedug shawl free form by following the lines from the various lace points. I measured 21 inches from the center point all the way around. About half way through I ran out of pins and Mr. Husband had to locate some in an old sewing box. Since I used two towels to block the piece, I pinned them together at the seam and taped them to the wood floor to keep them in place. Before washing, the Mommes Lysedug shawl measured about 24 inches in diameter. 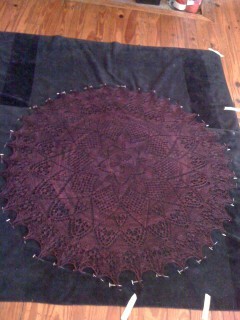 After pinning, the lace doily measured 42 inches across from point to point. 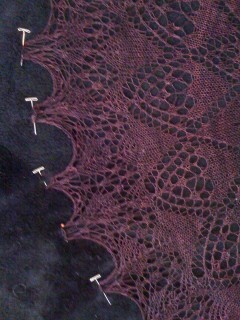 After removing the pins, the circular lace shawl shrank slightly to about 38 inches. The lace grew over 50% in diameter, although not as much as other materials. There is still stretch in the finished material. I was happy since I wanted a shawl to cover my shoulders and be more than a lace collar. For lace knitting, I prefer a material that will retain its blocked state rather than shrinking back. At the time that I bought the Tosh Lace, I didn’t realize this. In the future, I would take it into consideration. While I liked the Oxblood colorway, I wish that there was more of a pattern to the dying. I found the dark purples and blacks made reading the lace more difficult. Given the price for laceweight merino, I was underwhelmed with the yarn. The colors are wonderful as is the feel of the yarn but they didn’t perform well for the purpose of knitting lace. Despite my issues with the yarn, I love the piece although I could have done a better job of pinning the points. Here are some photographs to give you an idea of how it looks. I strongly recommend this lace project. The shawl is gorgeous. Love the color; love the pattern. Can’t wait to see you wearing it.